Whenever really cold days roll around, I’m all about soups and lots of it! 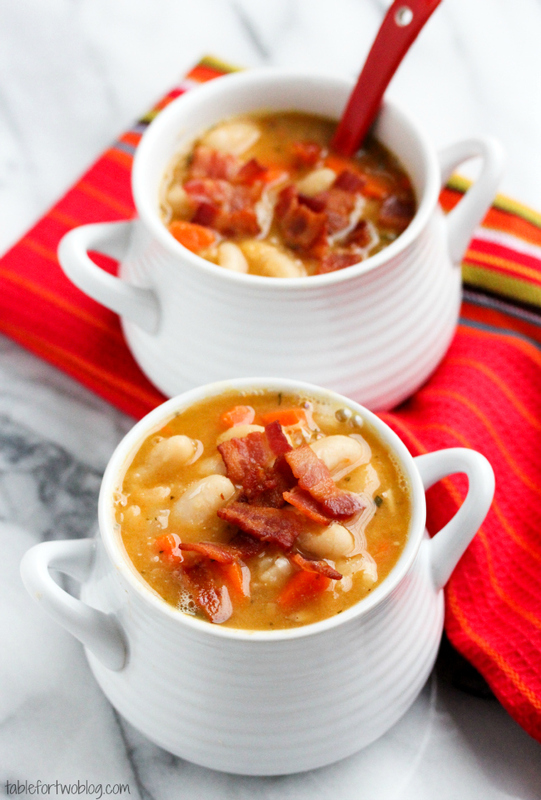 This creamy white bean and bacon soup is one of my absolute FAVORITES to make. I love making a big pot of soup and having it as leftovers for days. Sometimes, a really good soup gets better the longer it sits. 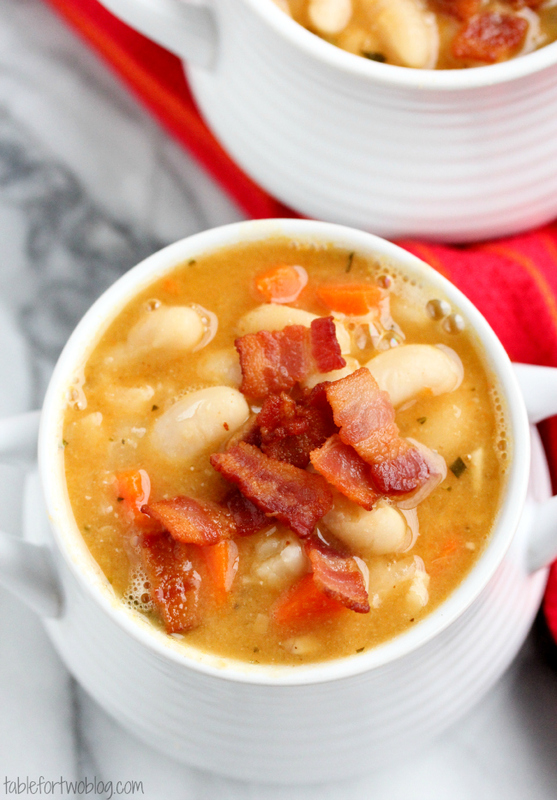 This creamy white bean and bacon soup is definitely one of those! This creamy white bean & bacon soup is perfect for those cold days and I’ve got a new video below to show you how to make it! I love how hearty it is and the texture was just the right amount of creamy. 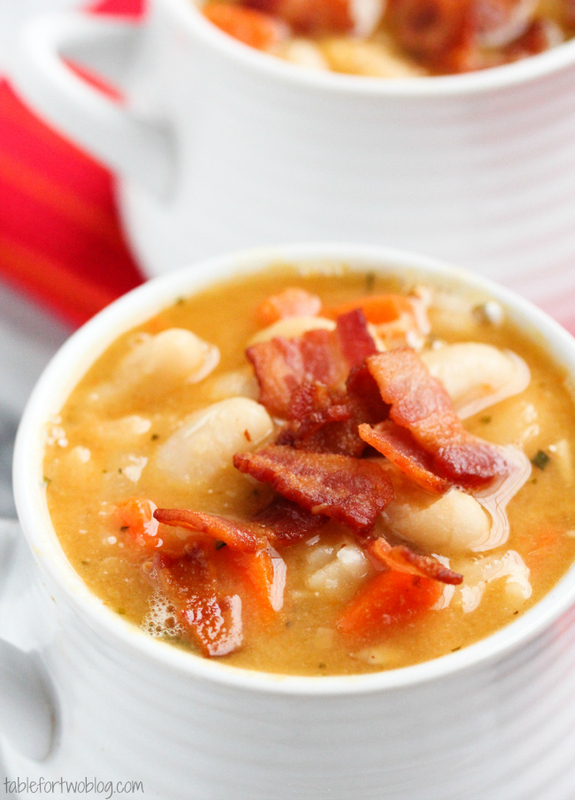 Everything that goes into this Creamy White Bean and Bacon Soup recipe! There were some whole beans and then carrots throughout every bite. And we cannot forget the amazing bacon that finished off this soup so nicely. The salty bite and flavor rounded it out extremely well. The best part of this soup came the next day. The longer this soup sat, the more the flavors developed and the creamier it got. I was so thrilled with how this soup turned out. It should be on your menu this week. It’s a cinch to put together. Just soak the beans overnight (or use canned beans for a quicker prep) and the soup will cook up in no time! One of my all-time favorite soups to make in the chilly weather! So much flavor and so creamy! Soak your beans overnight covered in water. Drain the next day and set aside. In a large stockpot, add the bacon to the pan and cook until bacon pieces are brown and crispy. Remove and let drain on a paper towel. If there's a lot of bacon grease in the pan, dump out all but 3 tbsp. of it. Saute onion, garlic, and carrots in the bacon grease until vegetables start to get tender, about 5 minutes. Stir in the rosemary and cook for an addition 1 minute. Gently pour in the chicken stock and add the drained beans. Whisk the tomato paste in until all has dispersed and incorporated into the soup. Bring mixture up to a boil then cover and let simmer gently for 45 minutes, stirring occasionally. Serve hot with bacon pieces on top. You can use canned cannellini beans if you want. I have never put a review on for anything before, but this soup was SO SO good I just had to comment. I made this exactly as the recipe says to, except I put only one can of beans in at the start of cooking. After about 30 minutes I used my immersion blender to get the consistency I wanted. Then I added the bacon and 3 more cans of beans. We didn’t eat it until the next day. The flavor was really good. My husband said it was the best soup he had ever had. Delicious!! Can you use the canned canneli beans also? 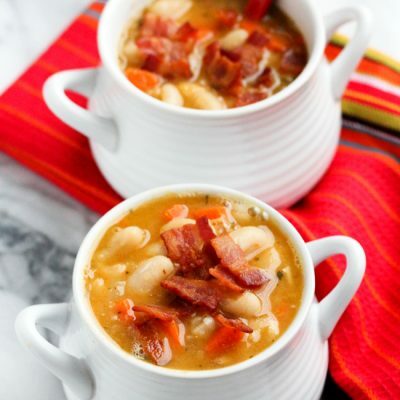 Best recipe for bean and bacon soup. Thank you, doll. Perfect. Follow the recipe exact. This was delicious! I used one large carrot and one stalk of celery since I didn’t have anymore carrots. I also used navy beans because I had them on hand. I had to cook mine longer than 45 minutes for the beans to be soft…probably close to an hour total. Thank you this will become a repeat at my house! I’ve seen a lot of food pictures but this the first time I have had a spontaneous mouth -watering reaction as I did with this soup. Definitely going to make this. I hope you do make it! It’s so yummy :) thanks for stopping by! I wish I had an immersion blender. I can make this but will have to leave the beans as is. The photography is wonderful. Thanks LauraAnna! I hope you enjoy! I used my potato masher in place of the immersion piece. A little longer to use but results are the same. Hi Kathy! I’m glad you made this and sorry that you wanted more flavor! I suggest, if you make this again, to increase the amount of rosemary and bacon within the soup, or add some salt and pepper. I didn’t include that in the recipe because bacon is pretty salty as it is, but if you feel that it needed more flavor, then maybe salt will be the answer! Thanks for the feedback! I can’t find cannelini beans– can I use navy beans? Thanks! I looked in my freezer for what to make tomorrow (didn’t think ahead of tonight) and saw this recipe. Looks perfect. I don’t have dried beans canned will work yes? Hi Jill – canned is perfectly fine! :) glad you found this site, too! You can also subscribe to my email subscriptions so you’ll get new recipes in your inbox every time I post something new; if that’s what you want! Saw this in your ‘best of 2013’ post and was really excited to discover it. Because whats better than creamy soup than creamy soup with BACON!?! I made this today and the whole house smells incredibely delicious. Can’t wait until it gets done. Thank you for this recipe. I’m so glad you were able to try this, Marge! It’s one of my favorite soups to make. I hope you enjoyed it! Hi, I was wondering if this soup HAS to be blended or is it as good without blending? Hi Shawn, no it doesn’t have to be blended. It’d just make the soup creamier, but if you don’t want to blend it, you definitely don’t have to! It’d taste just the same. I was looking forward to making this soup this week. But these beans are $10 for 3 cup bag. Can I use the canned cannellini beans? Or will that change the flavor? Or is there another bean that tastes similar for less money? 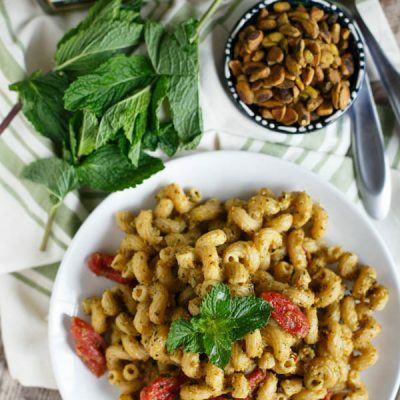 Hi Sha, if you take a look at previous comments and the notes section of the recipe, I mentioned you can definitely use canned cannellini beans. You can still look forward to making this soup :) enjoy! Hi! I ran across this recipe on Pinterest and I had all the ingredients on hand so I just had to try it! I used canned beans and did not blend it. Otherwise, I followed all the other steps. This was the first “homemade” soup I have ever made and I will just say that it was DELICIOUS! 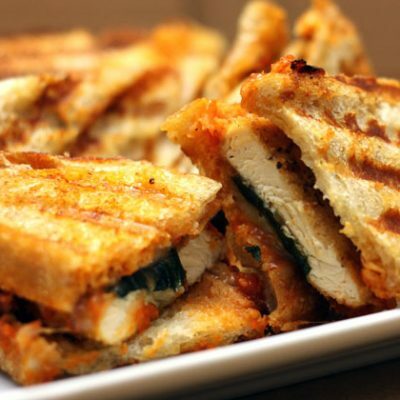 Very easy and flavorful! I topped it with finely shredded Parmesan cheese! YUMMY! I would like to make a larger batch and freeze it for the winter months. Do you think it will still taste fresh after freezing? Hi Rhonda, I think it’ll be fine to freeze it. I’m glad you enjoyed it so much! This sounds so good, but I am the only one in my home that will eat it. Yes, I live with people with no taste! 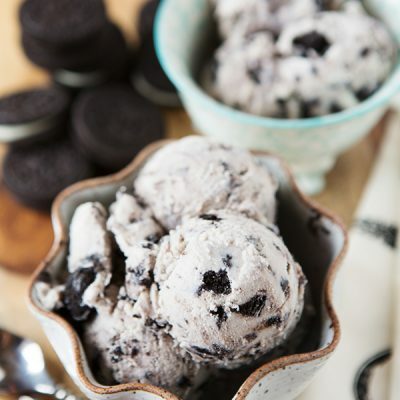 Can this be frozen so I can make it and not waste what I don’t get to right away? Yup, you can freeze it! Is there an alternate bean I can use if my local grocer doesn’t carry Cannellini Beans? You could try white navy beans. If I’m using canned cannelli beans, how much should I use? You’d use a 15 or 16-ounce can. Julie, this soup is delicious! Perfect for a winter day! I had some leftover stock vegetables with green lentils that I blended and then added to the soup. Mmmmm! Is there nutritional info for this recipe? Unfortunately, no. There are many reasons as to why I don’t post nutritional information on my recipes, one of which is that I’m not a registered dietician or nutritionist so for me to give any sort of nutritional information would be incorrect and inaccurate. There are also many differing factors when it comes to nutritional information and since I do not have the knowledge in this, I do not feel comfortable posting this sort of information. If you must have this information, there are many calculators out there (free and paid) that can help you with calculations. A quick Google search would pull up some of these calculators, but again, I’m not endorsing them as I do not know how accurate they may be. I will be making this today for lunch, hubby and I love soup and I make soup once a week, eventhough we live in Orlando Florida and it’s about 80 degrees here right now. So, am I reading the recipe correctly, there is no bacon (just the rendered fat) in the soup, just as a garnish? I appologize if I’m missing something!! You are reading it correctly :) it’s rendered fat for flavor and bacon is garnish, however you can definitely keep it in the soup if you want..like half on top and half in the soup :) it’s whatever you choose to make it! Enjoy! I love this recipe. I made it for dinner tonight and it was a hit!! I cooked my white beans first in my pressure cooker and then assembled the soup. I did find that I needed a little more rosemary and a squirt of sriracha to wake up the flavors! But…it was a total success!!!! Thanks for this one…it’s a keeper! Made this last night and it was fantastic! My husband has had major dental surgery and is just now easing back into eating solid foods. This was soft enough for him (no bacon on top) and filled all nutritional and gustatory needs. This is going into permanent rotation. Yours is one of my favorite sources for cooking inspiration. Thanks for never disappointing me! Aww thank you for the kind words! !